The car debuted at the Geneva Motor Show in 1973. The "Giovani" ("young people" in italian) by Pininfarina is the Turinese coachbuilder’s interpretation of the "dune-buggy", a category of small cars for the beach very much in vogue in the 70s. The project combines the search for a great cheapness of construction, achieved with simple lines and reduction of body parts, with a neat style, thought for a young public. As a starting point Pininfarina chose a small and cheap chassis, that of the Autobianchi A112, a model very welcome from young people. The car debuted at the Geneva Motor Show in 1973 and in the intent of Pininfarina there would also be a possible production, but despite the success of the prototype, it doesn’t start. 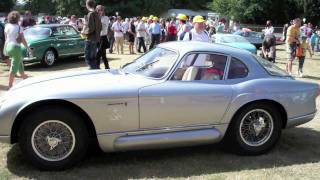 Goodwood Festival of Speed - Cartier "Style et Luxe"